Quentin Tarantino’s eighth film is also his second western and by his own admission, we can expect at least one more. To say that is an exciting prospect after The Hateful Eight would be a major understatement. The film opens on snow covered, western landscapes that would feel at home in any John Ford epic. Once we drop down into the cold of deep Wyoming we’re introduced to John ’The Hangman’ Ruth (Kurt Russell). He’s presently handcuffed to his latest bounty Daisy Dodomergue (Jennifer Jason Leigh) and is on his way to the Town of Red Rock to see her hang. He reluctantly opens his wagon doors to two wanderers, lost out in the wild with a storm coming; Major Marquis Warren (Samuel L Jackson), a legend for the north during the recently concluded Civil War and Chris Mannix (Walton Goggins), a southern sympathiser claiming to be the new Sheriff of Red Rock. Tarantino takes his time with the introduction of his first four characters and if it’s indulgent then it’s earned, as the differences between the ensemble become apparent. The dialogue sizzles and through bad tempered palavering, allegiances are made. Kurt Russell’s portrayal of John Ruth, a hard case whose bounties ‘always hang’ is superb. Russell hasn’t given a performance as unapologetically tough since John Carpenter’s Escape from New York and the comparisons don’t end there. The feel of Carpenter’s The Thing is by no means an unwelcome underlay throughout, and while Russell got to do his John Wayne impression in Tarantino’s earlier Death Proof, here ‘Jack Burton’s’ Wayne inspired drawl from Big Trouble in Little China is allowed to thrive. Not long after the stagecoach arrives at Minnie’s Haberdashery, a road stop café/bar, we meet the other four ‘Hatefuls’ and stay for the rest of the movie. Once in Minnie’s, Tarantino ratchets up the tension, each of these eight is as vile as the next and as such, trust is in short supply. Joe Gauge (Michael Madsen), a cattle hand, keeps himself to himself scribbling in the corner; Bruce Dern’s General Sanford Smithers shows his contempt for the bounty hunter beautifully in a single sentence; while Tim Roth’s hangman Oswald Mulberry shows signs of elegance, pondering the moral virtues of his profession with the newcomers. Shuffling through this theatre of bandied words is Bob The Mexican (Demian Bichir), who’s looking after Minnie’s while Minnie herself is away. It becomes apparent very quickly that one or more of the inhabitants of Minnie’s are not who they say they are and it’s from their questioning suspicion of each other that the characters shine. The film could be performed on stage and the tension and performances are easily on a level with Twelve Angry Men. Tarantino’s signature marks are everywhere, from ‘Red Apple’ tobacco to the bending (sometimes to breaking point) of movie rules, while the quick flash bloody violence doesn’t disappoint. This is Tarantino’s most politically charged film to date, even more so than Django Unchained, and rather than weigh the film down it elevates it to a point where no matter how vile the characters are, it is impossible not to understand, and in some cases, even sympathise with their viewpoints and motivations. Samuel L. Jackson is on career topping form, delivering some of his best lines yet, as well as an especially colorful monologue. Watching him go Sherlock Holmes on a mystery event in Minnie’s is truly a special moment for movie history, in general. It seems Walton Goggins voice box was designed solely for the purpose of delivering Tarantino dialogue. He excels not only in delivery but providing the films much needed funnier moments. Tim Roth slips comfortably enough into a role that sounds like it was penned for Christopher Waltz, although that feeling wore off quickly and Roth does a fine job. Praise must be given to Jenifer Jason Leigh for Daisy Dodomergue. The only female of the eight, she is a force to be reckoned with who holds your eye even when silent on screen, becoming at times almost demonic in her desperation to get the better of her captor. Quentin Tarantino has created a near perfect genre piece. Stamped with his own unmistakable style, backed up with jaw dropping cinematography from Robert Richardson and a subtlety used evocative score from Ennio Morricone, ‘The Hateful Eight’ is not to be missed. 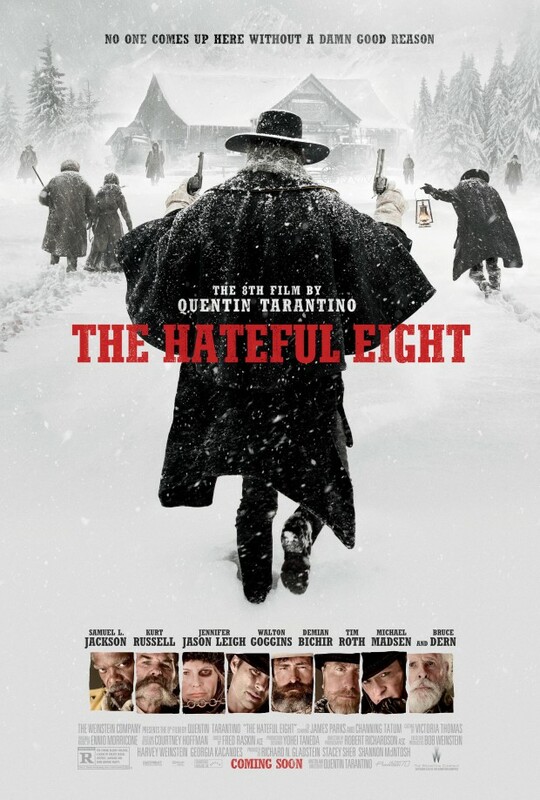 With glimmers of a scenic John Ford epic, John Carpenter-esque feel and dialogue that would not be out of place on stage, The Hateful Eight’s bandwagon of stormy characters illuminate the south. Kurt Russell thrives with a John Wanye inspired drawl, while strong performances from all cast members bring Tarantino’s sizzling dialogue to life- particularly Walton Googins, who seems to have been designed as a perfect vessel for Tarantino’s stylised and unmistakable style of storytelling. Samuel L. Jackson’s career topping performance will go down in history, alongside Jennifer Jason Leigh’s almost demonic portrayal as the only female of the Eight. With his second western Tarantino’s has out done himself, keeping his signature marks imprinted alongside bursts of bloody violence. The Hateful Eight is a politically charged character led ensemble piece that sticks to its genre like glue, without losing any of its directors trademark credentials. This is Quentin Tarantino at his very best and with his second western, he has truly out done himself.